As far as I could tell, driving a bouncing 4WD with 4 passengers along a rough station track in search of Australia’s rarest bird wasn’t cramping the gun birder’s style one bit. 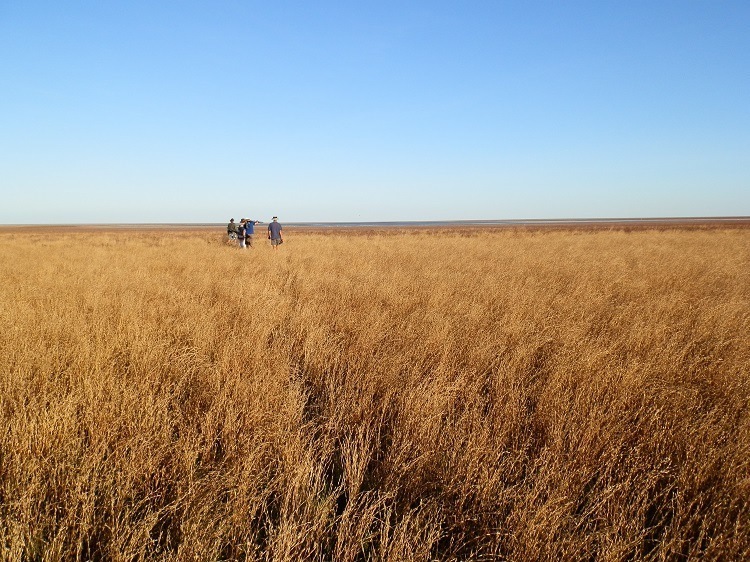 All I could see were the vast, rolling plains of grass and samphire stretching to the horizon against an endless blue sky. But our driver and guide on the Broome Bird Observatory Yellow Chat tour, unfazed by the spectacular scenery, could spot a bird at a hundred paces. Calling birds to the left, right, in front and behind, he parked the 4WD at the massive lagoon, our destination and site of multiple Yellow Chat sightings, handed out the telescopes and set off at a brisk trot through the probably snake-ridden samphire towards the middle distance. The non-birdo Melbourne yuppie couple who’d joined us on the tour glanced at each other apprehensively. I was guessing the tour wasn’t proving to be exactly what they’d thought. Then I saw it. Over by the lagoon, a dark bird shape lurked on the shore! I pointed it out to Pilchard. And the yuppies. AND the GUN BIRDER! Who immediately trained a telescope in the general direction and invited me to step up and identify the bird. As if. But I obligingly hoisted my camera out of the way and peered through the eye-piece, immediately diagnosing why the bird hadn’t moved. Because even when they’re bird-shaped, pieces of driftwood rarely do. At least the sudden and immediate loss of credibility left me free to take photos. And I DID see the elusive Yellow Chat – although YOU won’t! Not here, anyway. They were too far away to get a good shot. But who’d doubt a gun birder?? Although one of the most significant migratory shore bird sites in the world, where thousands of waders – more than 300 species – congregate each year, it’s still apparently OK to drive along the pristine shores of Roebuck Bay. Because successfully negotiating the huge 9+ metre tide, treacherous rocks, mangroves and soft sand hazards would REALLY give those driving skills a workout, wouldn’t it?! Having to phone a friend to pull you out when you’re bogged might be a little embarrassing. But then who do you call when BOTH of you are hopelessly bogged and that massive tide’s rolling in?? However, the chances of a massive all-body blush on the skipper who had to explain why two vehicles were trapped in the bay below the Broome Bird Observatory to the insurance company were actually very low. 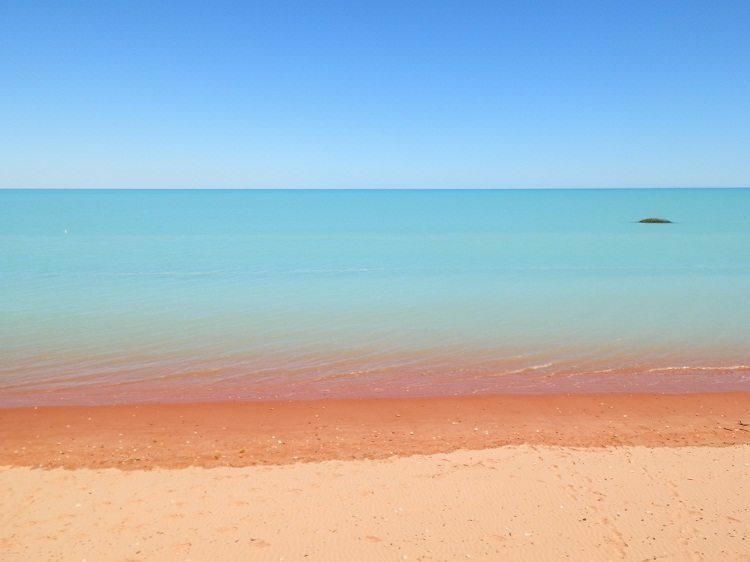 In north-west western Australia’s Broome region, the Indigenous Yawuru people’s season of Barrgana is characterised by day after punishing day of endless blue sky, daytime maximum temperatures between 28°and 31° C, coolish nights and no rain. That’s why the smart travellers head to Broome during the Aussie winter from June to August. The smart birders head to the Broome Bird Observatory in August as the temperatures increase because that’s when the migrating wading birds start to arrive. Fog and Dew – isn’t this the DRY season? A change dropping the temperature by a few degrees was a welcome respite from the mini-heatwave in the depths of the moistureless and arid dry season. But who knew an early morning fog would momentarily change the landscape into a magical wonderland?? 4 The Birds, the BIRDS! After my embarrassing sighting of the rare driftwood bird (see #1 above), I spent the rest of our BBO stay with my mouth firmly – and uncharacteristically – shut. I and my small camera with the non-detachable lens were decidedly outclassed by the big lens birding brigade, so my photos from the Broome Bird Observatory show embarrassingly few actual birds. Maybe my big bird photography lens envy was cramping my style. Mostly Red-necked Avocet – Spot the ODD one out!!! As I swung our borrowed ‘scope (that’s ‘telescope’ for you non-birders out there) along the length of ‘Wader Bay’, the morass of what I thought to be pebbles and rocks at the waters edge jumped into focus to as hundreds and thousands of birds!! But despite the excitement of clocking up lifer after lifer (birds we’d never seen before) through the magical magnification of ‘scope and bins (binoculars!) the huge mixed flocks moving ever closer with the tides remained resolutely rock-like in my photos. And in league with Yellow Chat, many birds unaccountably failed to present in perfect photographic pose, best side conveniently facing my looming lens. Is it so wrong to prefer mediocre landscape photography to mediocre wildlife photography? Birds spotted AND badly photographed at Broome Bird Observatory! Those who know me will undoubtedly assure you I’d never be so impolite as to point out the faults of others (and you can probably hear them laughing wherever you are right now …). NOT Birds – Mulla Mullas!! NOT possessing the birding gene can work against one at the Broome Bird Observatory, but it isn’t necessarily a character flaw! It’s actually an advantage to budding anthropologists wishing to observe the ups and downs of daily life for participants in the extreme sport of bird-watching. Of course it’d be rude to point out the birder’s quirks, flaws and foibles. Seeing a bird – ANY bird – in the distance isn’t a signal to stop what I’m doing. ‘Eating’ and ‘Birdwatching’ are mutually exclusive activities. So are ‘Conversing’ and ‘Birdwatching’. I’m a recovering non-birder with a photographic fixation. Don’t hate me because some of my photos don’t have birds in them. Call me crazy, but I’ve been known to select holiday destinations without knowing what birds I’ll see there. And I collect brochures about attractions other than birding hotspots. I don’t know how many birds are on my ‘lifer’ list. No, I don’t want – or need – any help with that. 6 Is the Sea Blue? OR BROWN?! Fresh from King Sound and the highest tides in the Southern Hemisphere, the school group from just up the coast in Derby descended on the Broome Bird Observatory viewing platform like a flock of rampaging emus. Any self-respecting bird would run a mile. 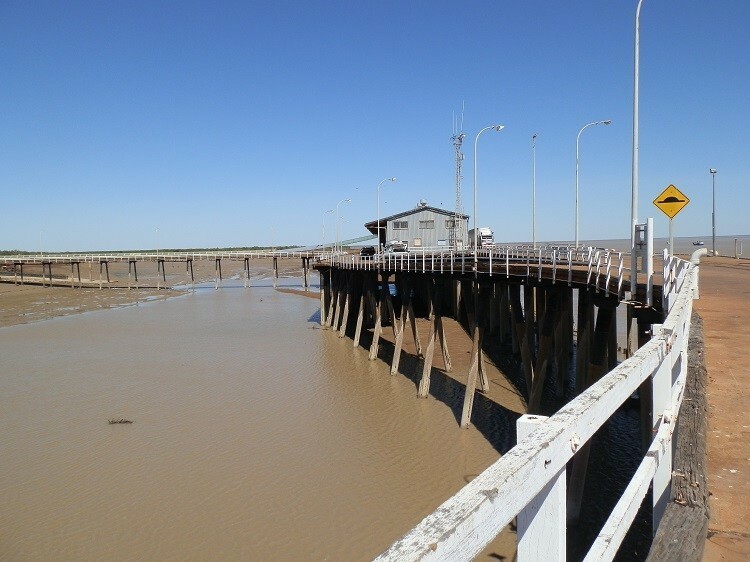 But the famous Roebuck Bay tranquillity slowly worked its magic. Well … that and a few well-chosen witticisms from the long-suffering teachers. ‘Send me a postcard, mate,’ one teacher called out over the hubbub to a young student indulging his not-so-secret passion for telescope wrangling. ‘What, miss?’ He turned, puzzled. ‘Because if you keep that up, you’ll be WALKING home to Derby,’ she shot back at him. Chastened, the group calmed and looked out over the famous blue, Blue, BLUE of the bay. ‘Where’s the mud, miss?’ another student ventured. This time I was puzzled. Until I recalled that not so far up the coast at Derby, the tidal movement of the 9th biggest tide in the world moves tonnes of mud up and down King Sound. So for these students brought up on its shores, the sea is BROWN! Who says travel doesn’t broaden the mind?!?! A few kilometres north of Broome and run by Birdlife Australia, the Broome Bird Observatory is a rare opportunity to explore a different side of Australia. If you’re not afraid to rub shoulders with birdos, the BBO offers accommodation, a camp-ground and tours to birding hotspots. You don’t have to be a twitcher (ie birdwatcher) to explore the stunning coastline, discover amazing wildlife and wildflowers, walk the trails through woodland habitats or relax around the evening campfire. Have I talked you into it? Get started on YOUR Broome adventure with cheap flights right here! NEXT Post: Lake Cullulleraine – So Cool it’s HOT! @Rocky Travel – Thank you!! But I can’t imagine being there in FEBRUARY!!! The tourist season is very short – June, July & August are generally cooler and less humid, but can still be HOT!! @FruitCake – Who am I to judge whether the avocets are red-necks or not 🙂 The frogmouth became a no-brainer that made me look good to the real birdos – I could ‘discover’ it every day and show it to the people who just got there!!! Childish, but fun!! River beat me to it [them]. In fact, one of the red necked [as opposed to red-necks?] avocets appears to be glaring at the interloper on the right. Fantastic shot of the tawny frogmouth. @Zosia – Thank you! I’ve heard of the similarities from another blog buddy, Saucy Kod! One day I’ll have to see them for myself!! Beautiful. The red soil reminds me of the Maritime Provinces in Canada (Newfoundland, Prince Edward Island and New Brunswick). yep that’s the red dirt pindan, and the brown mud, and the huge tides! @Jill – Glad you enjoyed it … it’s an unmistakeable landscape, isn’t it?! @Tez – Actually, it’s no hardship whatsoever to share what I’ve found!! Writing about it is a way of reliving it – and the singing in your heart echoes mine while reminiscing! @Alessandra – Really, you could pick anywhere you haven’t been and find something wonderful to see!!! I hope I can inspire you!! @Ramakant – Haha, I would have LOVED to show you more birds – but they just moved around too quickly for both my eye and my camera! Luckily, the landscape IS amazing – so that’s what filled my SD card!! @Sioux – Sorry to break it to you – the landscape really DOES look like this!!! My technical skills are WAY too poor to be able to doctor shots so they look this good!!! I hope I’ve inspired you to see it for yourself!! @ladyfi – Great minds think alike – it’s probably my all time favourite travel shot! @PDP – I’d never seen anything like Broome. And still haven’t!! My shots are just a reflection of the beauty of that landscape – and it’s almost a fluke if there’s a bird in them!!! @Sallie – SO glad the Florida birds are better behaved!!!! I’ll have to send the Broome birds up there for lessons!!! @diane – For me the BBO was a chance to see more of the astonishing colours and landscapes of this glorious part of OZ! I did enjoy seeing the birds – but I’ve got a low tolerance for affectation!! @Carole – I’ll leave the REAL bird shots to people like you!! I know I’d need a different camera – but don’t want to carry all the gear around! So great you enjoyed my (mis)adventures! @River – Good girl! You’ve done very well – just don’t ask me to identify the imposters!!!! The foggy morning pic was (I believe) a rarity for that time of the year! @George – Thank you so much! But lets just say I know my place in the photographic pantheon!! And lets also say that doesn’t worry me one bit!! @Jim – A far cry from Sydney, huh?! @TMWH – Thank you! I live for my readers’ approval – I’d like to think that while not as technically perfect as a professional photographer, my photos are at least accessible – and real! WYSIWYG! Thanks for the lovely narration and lovely pictures. Would have loved to see more birds, but the landscape is quite amazing as well. PleasePleasePlease tell me you completely “played” with the colors in these photos. They are too gorgeous to happen in real life. Seriously (and I was being serious about looking at your pictures with my mouth gaping open)–these are so beautiful. We didn’t go to the bird observatory. Great place Broome, I could live there. What a place and photo, but I read up to the drift wood and the bird you didn’t photograph, will keep the rest in case I am visiting that part of Australia… still to decide which part I would like to see next! When I travelled I only managed to get around the bottom half of Oz before I got sick and had to return home to Perth. Now I am so glad I found your blog because I can see all the beautiful sights through your eyes. And you do have a fabulous camera eye. Thank you so much for sharing your travel shots and stories – they make my heart sing. Hard to believe those Brome birds don’t pose fetchingly for you whenever you see them…I’m sure you can tell from my blog that Florida birds always do! Sure. I know some of the birding terms, but gun-birder was new to me and kinda’ scared me for a minute; I wondered if you got on a hunting our by accident or something. Oh and it’s also hard to believe that you choose places to go based on scenery instead of birds. Imagine that ;>)…(and beautiful scenery it is as usual). Isn’t the sea a magic colour over there. I didn’t hear about BBO when we were there but then I feel exactly the same about birding as you. I love watching birds and seeing new ones but I am hopeless at photographing them and would much rather shoot the scenery. I can never remember the names of birds except the very common ones. Your shots are great and a funny post too. I agree with Fiona, the first image is a stunner Red. Broome is such a contrast between the amazingly beautiful and the pretty grungy spots. I agree with you about the birding, I lack patience but can imagine it would be so rewarding. Meanwhile I think you do amazing things with whatever camera you have. I’ve always believed that its not the camera but he eye looking through i that makes a top sho. Thank you for a fascinating (and humorous) post. I’ve never thought of your landscape photos as being mediocre. These photos are marvelous, as are your word pictures. Beautiful shots. The first one is breath-taking! What? Your photos are outstanding, whether there’s a bird in them or not. Such color, such balance in their composition–you’re great! I’ve never seen Avocets, but I spotted the odd one out, then spotted another one! There’s one just left of centre with a black head and one over to the right with a white head and black back. I like that Foggy Morning photo. Beautiful colours, Red – but what I’d most like to comment on is something I’ve been noticing since I discovered your blog, and that’s the quality of your writing. This post is just another example of how perfectly you put facts and personality together. As for ‘lens envy’, I intend to plagiarise that somewhere soon. @SFlaGuy – Aha! I KNEW there was a reason you hadn’t been round for awhile … but what do you mean, life is ‘getting’ a little weird????!!! @Filip – It’s a bizarre fashion statement – but it works!! @Saucy Kod – Haha, nothing gets past you!!! Lucky those mangroves (trees) in the water can survive a dunking – they get two every day!!! @FigMince – Thank you so much!!! And congratulations: You’ve now been elevated to VIP reader status!!!! I look forward to seeing your plagiarism soon!! 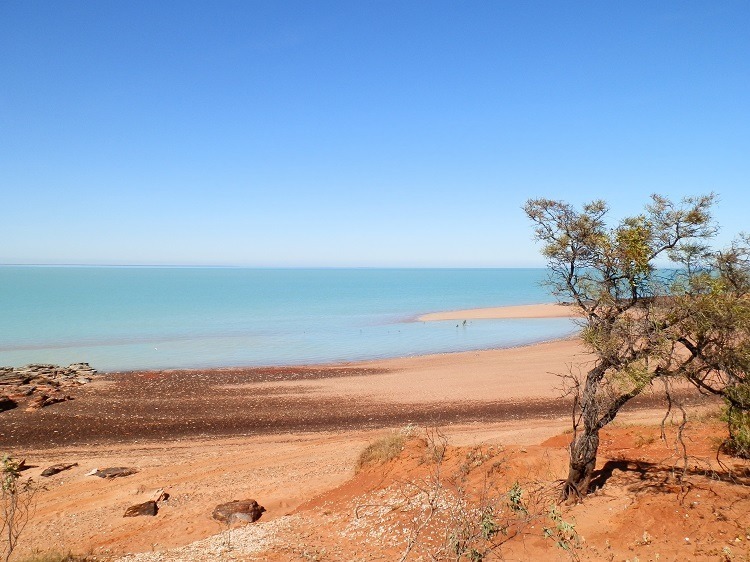 @eileeninmd – You’d LOVE it up there in Broome! I’m sure your bird photos would be WAAAAAY better than mine!!! Wow, what an awesome place to visit. The birds are all very cool, especially the Frogmouth! I would love to go birding there someday. Great post and awesome photos. The red sand is really special in combination with the water. I should sail with my new bird to your lovely land. Instead I will be taking a rum soaked weekend away as a pirate. Yep – life is getting a little weird in South Florida.